Marina Keegan's star was on the rise when she graduated from Yale in May 2012. She had a play that was to be produced at the New York International Fringe Festival and a job waiting for her at the New Yorker. Tragically, five days after graduation, Marina died in a car crash. As her family, friends and classmates, deep in grief, joined to create a memorial service for Marina, her unforgettable last essay for the Yale Daily News, 'The Opposite of Loneliness', went viral, receiving more than 1.4 million hits. She had struck a chord. 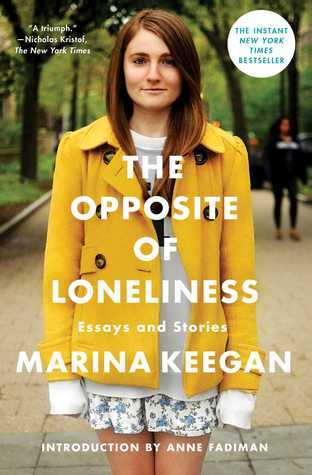 Even though she was just 22 when she died, Marina left behind a rich, expansive trove of prose that, like her title essay, captures the hope, uncertainty and possibility of her generation. The Opposite of Loneliness is an assemblage of Marina's essays and stories that articulates the universal struggle we all face as we work out what we aspire to be and how we can harness our talents to make an impact on the world. I have mixed feelings about this book. In many ways it wasn't the book for me as I'm not sure I could particularly rave about any of the stories contained in the book. Don't get me wrong. The stories were interesting enough and showcased what sort of writer Marine could have become but being only short stories there wasn't enough for me to get my teeth into. The felt like samplers and that there was something lacking and more was needed to make them whole. Therefore for me this book was a snapshot of the potential the writer had. 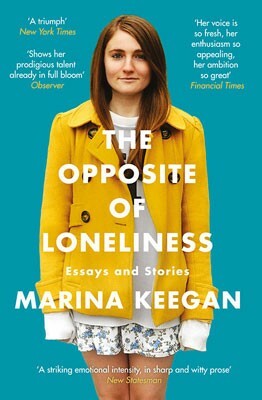 You can see from the selection in there that Marina had a lot to say about current affairs and her stories and essays reflected that. The voice in some of her stories showed she had a real talent to capture the voice of a 20 something year old who had just finished college and about to embark on a journey into the real work. I've heard it said that it should be considered a YA book bit I don't think that is necessarily true because I think the essence of YA is to capture what it means to be a teenager which this book doesn't do. So ultimately not really the book for me but interesting nonetheless and certainly worth a look particularly if you enjoy short story collections.